“Kaonite – Calcined Kyanite - Produced at temp. >1400 Deg. C. backed by Micronising, Screening & De-dusting. 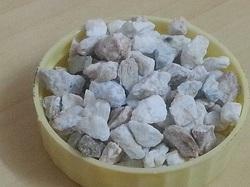 Kynite stone available. best color. and appropriate size. KYANITE is the allotropic varieties of metamorphic mineral corresponding Al2O3 and SiO2 they form useful Alumino-Silicate superduty refractory material. Kyanite when heated above 16500 C it convert into mullite (3Al2O3. 2SiO2) which has high refractory properties and high strength. Green Kinite is another color of kinite. This very pleasent and color full color . According to astro world or healers this is highly recomendad stones for prousperity. - There is no combined water, Co2 or other volatile present in the ore.
- The elements Alumina and silica constitute more than 95% in all forms of kyanite family, which forms the chief source of our raw material. Blue Kyanite is especially good for working with the Throat Chakra and communication issues. Blue Kyanite helps to speak one's truth with clarity, making it a great stone for public speakers and performers.Blue Kyanite also facilitates an alignment of all the subtle bodies, creating a larger and stronger aura. 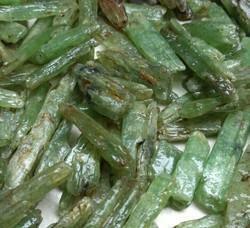 We are a noted manufacturer, supplier, wholesaler and trader of premium grade Kyanite Mineral which is a naturally occurring mineral made of aluminum silicate. The product is best known for its features such as high specific gravity, insolubility in water, low abrasiveness to under coats and non-toxic nature. The Kyanite Mineral offered by us is generally a blue silicate mineral which is commonly found in aluminum rich metamorphic and sedimentary rocks. Our expert procuring team has selected our vendor base on the basis of various parameters like quality raw material used, market reputation and timely delivery of the products. We Manufacture Kyanite Grains, powder and Classifier fines in different sizes. Kyanite is used in refractories. Grain size: 1-0.5 mm /1-3mm/3-5mm/5-10mm. Powder sizes: 100 mesh, 150 mesh, 170 mesh.